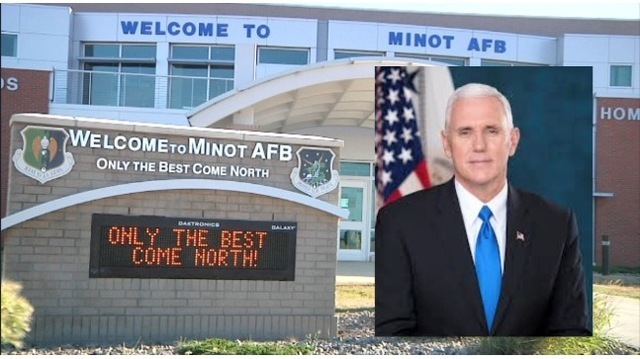 Vice President Michael Pence visited Minot Air Force Base (AFB) in North Dakota Friday, and in doing so, became the first sitting Vice President since 1971 to visit America’s nuclear missile arsenal. His visit comes after President Trump’s Visit (to North Dakota but not necessarily to Minot) on September 6, and Secretary of Defense Mattis’ visit on September 13. Pence vowed that the U.S. will keep up economic and diplomatic pressure on North Korea to abandon its nuclear and ballistic missile programs. The base is home to both B-52 bombers and intercontinental nuclear missiles. With a huge B-52 in the background, Pence thanked the roughly 250 assembled airmen for their service. He told them President Donald Trump is committed to maintaining America’s nuclear powers as a force for peace. Pence’s visit to the Minot base coincided with Defense Secretary Jim Mattis’ visit to the Demilitarized Zone that separates North Korea from South Korea. Mattis accused North Korea of threatening global order and said the Trump administration remains committed to compelling the North to accept complete nuclear disarmament. Defense Secretary James Mattis toured the base in September, in a visit widely seen as a reminder to North Korea of U.S. nuclear capabilities. U.S. Rep. Kevin Cramer says the nuclear assets in North Dakota have never been more relevant. Minot has one of the nation’s two B-52 bomber bases. The base also oversees 150 of the Air Force’s 450 Minuteman III nuclear missiles. The fact that the three top officials in the United States have now ALL personally visited America’s Nuclear Arsenal does not bode well for North Korea. If they “respond” then the situation remains rational. If, however, they “react” then things could escalate VERY fast.